Splash pages, you gotta love 'em. A blank canvas where the artist can hit you with a large dose of illustrated 'wow'. 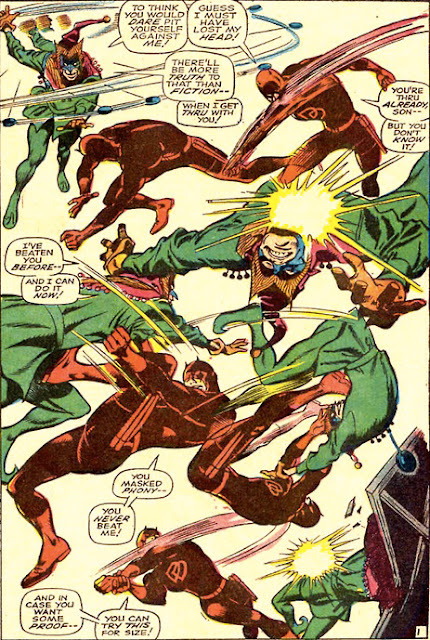 This week, what better way to celebrate St Patrick's Day, then with Marvel's Irish Catholic Avenger; Daredevil - drawn by the guy that brought out the Irish scrapper in him best; the late and great Gene Colan. And the other dude is even wearing green - how more apt can a splash page be (without being inked by Ed McGuinness that is)? Few can top a fight scene drawn by Colan. The way he crammed so many angles into the scene and created a new kind of pacing in the process, will stand the test of time. For more great splashies, click here, otherwise, Happy St Patrick's all!